The GDBC thanks Charles Hipkin Chairman of the Great Dane Club for his article on the background to the research on DCM. The Great Dane breed is in a very fortunate position in that our breed has been the centre for research into dilated cardiomyopathy (DCM) by Liverpool University. For those who are unfamiliar with DCM, it is a disease of the heart that, if undetected and untreated, can cause sudden death. Mrs Hannah Stephenson of Liverpool University`s Small Animal Teaching Hospital has been, for some time, scanning older Great Danes to firstly quantify the incidence of DCM in the breed and subsequently, in the medium term, to discover ways of more easily diagnosing the disease and finding more effective treatments once diagnosed. In the long term, the hope is that a DNA test can be evolved in order that our Great Danes can be tested at a very young age and, with the information that the test will provide and judicious, careful breeding this disease can be eradicated from our breed. The research project has been fully endorsed by The Great Dane Breed Council which now controls The Great Dane Register of Hereditary Diseases fund. Liverpool University have asked the breed for more funding to continue this vital research and, so far, the breed has responded magnificently to the tune of £11,000. Together with Liverpool University we are making a case to The Kennel Club Charitable Trust to, at least, match this sum and we should know shortly whether or not we have been successful, whatever the outcome this research must continue. Mrs Stephenson would like to scan as many Great Danes over the age of 4 as possible, as the larger the sample she examines the more accurate and representative the results will be. Apart from scanning, Mrs Stephenson would like blood samples and pedigrees from any Great Dane DEFINITELY diagnosed with DCM, living or post mortem. Mrs Stephenson is extremely committed to this research and to Great Danes and has enthusiastically promoted her research within our breed and beyond. This is a golden opportunity for us to eradicate a serious condition from our beloved Great Danes and we must not miss this chance. Thanks to the generous and co-ordinated efforts of all the Great Dane Breed Clubs and some individuals, Liverpool University was able to make a submission to The Kennel Club Charitable Trust requesting further funds to add to the Clubs` £11,500. The KCCT has very generously granted us £18,275, taking the total fund up to nearly £30,000. This money will enable Hannah Stephenson and her team at Liverpool University to scan more Great Danes and to be able to have dogs back, already scanned, for a yearly check up. It has to be said that this is a long term research programme with the ultimate aim of eliminating DCM in our breed by DNA analysis a long way off. However, in the interim, we anticipate that this research will provide good information that will allow local vets to better diagnose and treat those dogs with DCM. With this in mind, we must all keep our eyes firmly on the ultimate objective. If it`s not too melodramatic to quote Churchill, “This is not the end, it is not even the beginning of the end but it is the end of the beginning”. It has come to our notice that some are using the fact that their Dane has been scanned at Liverpool and declared clear of DCM in their adverts for puppies and studs on the web and I know that Hannah is disturbed by this. Anyone who understands what this research is about will know that it is just “research”. DCM is a late onset disease in Great Danes and, as yet, we do not know the mode of inheritance so to declare that a Great Dane is clear of DCM, on this basis, is wholly inaccurate and very irresponsible and could easily undermine what we are trying to achieve. I would urge anyone tempted to use Hannah`s results for advertising, either through ignorance or for commercial gain, not to do so. Hannah has promised that she will keep the Breed fully updated on how the research is progressing. Below we are reproducing an article that Mrs Stephenson very kindly wrote on DCM and published in the Great Dane Club’s Winter 09 magazine. Dilated cardiomyopathy (DCM) is one of the most common heart diseases of all breeds of dogs. As the name suggests, it is characterised by progressive thinning of the heart muscle, and dilation of the heart chambers, with concurrent severely impaired pumping ability of the muscle (impaired contractility). Dilated cardiomyopathy is a particularly difficult disease to control in dogs as it is an adult-onset disease. Studies have shown that dogs can have ‘occult’ DCM (i.e. they have the disease but do not show clinical signs) for many years before developing signs, and therefore may have already been bred many times before anyone becomes aware that they have heart disease. We are currently trying to collect and analyse DNA samples from Great Danes in the hope of identifying the gene(s) responsible for the disease and eventually developing a genetic test, which could identify dogs at risk from a very young age. The normal function of the heart is shown in Figure 1 Blood low in oxygen returns from the body to the right atrium and from there to the right ventricle. 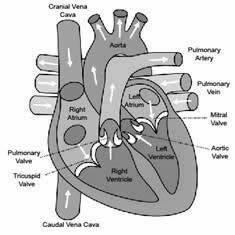 As the heart contracts, the right ventricle pumps the blood to the lungs via the pulmonary artery, where the blood picks up oxygen. Oxygen-rich blood returns from the lungs, via the pulmonary veins, to the left atrium and then the left ventricle, and the left ventricle pumps the blood around the whole body via the aorta. As the left ventricle has much more work to do, it is usually larger and more well-muscled than the right ventricle. 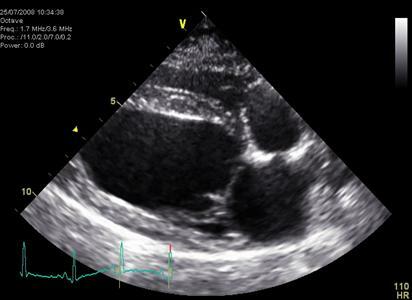 Dogs start to show clinical signs of dilated cardiomyopathy when the heart’s contractility is so poor that it is unable to pump blood around the body efficiently. Initial signs may just be that the dog is less able or willing to exercise, as their tissues are not receiving the blood and oxygen they need to work harder during exercise. 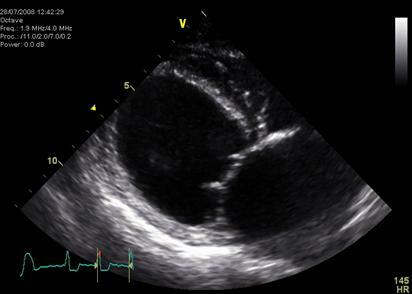 Dilated cardiomyopathy will eventually progress to heart failure. If the heart is unable to pump efficiently, it is unable to move blood returning from the body or lungs, and therefore blood backs up in the vessels of the body. Fluid is constantly moving between the blood vessels and the surrounding tissues, and therefore an increase in pressure in the vessels (due to back up of blood) pushes more fluid in to the tissues (see Figure 2). Heart failure is usually classified as left-sided, right-sided or both. Left-sided failure occurs when the left ventricle fails to move blood returning to it from the lungs. Right-sided failure occurs when the right ventricle fails to move blood returning to it from the body. A build up of fluid in the lungs is known as pulmonary oedema. The accumulated fluid reduces the amount of oxygen that can pass from the lungs in to the blood stream. Dogs with pulmonary oedema often show breathlessness (dyspnoea) and exercise intolerance due to poor oxygenation. They often will also cough as the body’s reflexes try to clear the fluid from the airways. A build up of fluid in the abdomen (associated with right-sided failure) is known as ascites, and can result in a pot-bellied appearance. In order to be definitively diagnosed with DCM, a dog must have an ultrasound examination of the heart (echocardiography). The diagnosis is made based on measurements of the size and contractility of the heart, and the exclusion of any other heart disease which might produce similar signs. ACE Inhibitor (e.g. Fortekor, Vasotop, Enacard). These drugs counteract the adverse hormonal effects that heart failure has on the body. They also dilate the blood vessels, reducing the work the heart has to do. Vetmedin. This drug helps to improve the pumping ability of the heart, and also dilates blood vessels in order to reduce the work the heart has to do. This is the same view of the heart of a dog with DCM. The left ventricle is enlarged and much more rounded, and the left atrium is much larger than normal. In this case, the right side of the heart is barely visible. It has long been known that Great Danes were one of the breeds predisposed to DCM, but little research has so far been published about DCM in this breed. One study estimated that the prevalence of DCM in Great Danes was about 4% (i.e. four Danes in every 100 Danes has the disease). This prevalence is significantly higher than in the pedigree dog population as a whole, but similar to the estimated prevalence in other predisposed pedigree breeds (see Table 1). More recent studies looking at DCM in the Newfoundland and the Doberman have found the prevalence to be much higher than previously estimated. This is attributed to the fact that these studies were screening large numbers of outwardly healthy animals, and identified many more animals in the occult phase of DCM, that previously would have been counted as ‘healthy’. For example, the true prevalence of DCM in the Newfoundland is now suggested to be about 17% (see Table 2). We know that DCM can occur in family lines of Great Danes, and therefore that the disease can be inherited. There is some evidence to suggest that DCM is inherited on the X chromosome in Great Danes (i.e. is X-linked recessive), meaning that the majority of dogs developing DCM are male dogs and female dogs tend to be carriers that do not develop disease. However, this was determined using a small population of American dogs, and we do not know for certain if this applies to the whole Great Dane population, and particularly to the UK population. Some cardiologists have been suspicious for some time, that Great Danes are predisposed to developing life-threatening (ventricular) heart arrhythmias as part of their ‘type’ of DCM. These arrhythmias can cause collapsing episodes in affected dogs, and sometimes cause sudden death of dogs before they have any clinical signs of heart disease. This is a similar situation to that seen in Doberman’s with DCM. Many of you will now have heard about the recent research being conducted in to DCM by the LUPA project. LUPA is a large, European consortium of veterinarians and geneticists investigating a variety of inherited diseases of dogs in a number of breeds, including DCM in Great Danes. The group hopes to use a novel method of genetic analysis to identify areas of DNA that are different in dogs that have a disease (e.g. DCM), compared to dogs of the same breed that are healthy. The aim is to identify the gene or genes responsible for each disease in each particular dog breed, and it is hoped that the information can then also be used to look for similarly abnormal genes in humans with the same disease. We have been screening Great Danes (and a smaller number of dogs of other breeds) at the University of Liverpool over the last 8 months. Our aim was to screen healthy, older Great Danes in order to identify our ‘healthy’ group of Danes for the genetic testing. We have stored DNA samples from all of the dogs screened, and obtained pedigree information from them. We have now screened 64 Danes aged 6 or over, free of charge, from breeding and from pet homes. In co-operation with our research partners, we will soon achieve the total of 50 unrelated Danes with DCM, and 50 unrelated healthy Danes that are required to perform the genetic study. This is fantastic news, and hopefully we will soon be able to report the results of this study. However, we have also been able to gain much-needed information about the disease in this breed in the UK, and, as with many research projects, raise more questions that need to be answered! Although not specifically designed as such, LUPA was the first large-scale DCM prospective screening study of Great Danes in the UK. Screening large numbers of dogs has allowed us to more accurately estimate the prevalence of the disease in Danes in the UK. Despite the majority of dogs included in the study being outwardly healthy older Danes, a surprisingly high number of these Danes were diagnosed with DCM (in the occult, or pre-clinical stage), as a result of our screening. Our findings would suggest that the prevalence of DCM in the UK Dane population could be as high as 20-25% (i.e. one in five Danes could have the disease). We have also identified a lot of Danes that are having heart (specifically, ventricular) arrhythmias that are picked up on an ECG. Although these arrhythmias can have a variety of causes, we are often finding these arrhythmias in dogs that have DCM. We have also heard many reports of Great Danes dying suddenly (often at exercise), and at very young ages. We have also found Danes with dilated cardiomyopathy in the same families as dogs that are reported to have died suddenly. We also know that at least two of the dogs we diagnosed with DCM have subsequently died suddenly, most likely as a result of a heart arrhythmia. We cannot claim that all Danes dying suddenly are having heart arrhythmias, or that there is a link between sudden death and DCM, but we would like to investigate these findings further, as this could be a very important component of DCM in Danes that owners and vets need to be made aware of. Finally, from the small amount of information that we have obtained via pedigree analysis, it would appear that DCM is unlikely to be X-linked recessive in Great Danes in the UK. We have diagnosed similar numbers of male and female dogs with the disease, and the disease appears to occur in multiple generations in the same families. We need more information regarding relatives of DCM dogs before any definitive conclusions can be made. We still have some funding available from the LUPA project, and so we would welcome any more Danes, aged 6 or older, to attend our screening sessions. Just to remind you, the screening is free of charge, and includes a full clinical examination, heart scan, ECG and health-screening blood sample. The Great Dane Club have also kindly agreed to contribute towards travel expenses for those of you who travel from over 100 miles away. The breed clubs and the Breed Council have kindly raised more funding for an extension of this research, outside the LUPA project, and the Kennel Club has also agreed to provide funding for this. We hope to screen many of the Danes we have already seen, again, and we hope to invite younger dogs for screening, particularly family members of dogs with DCM, to investigate how the disease is inherited. We hope to investigate the significance of heart arrhythmias in the breed, and identify new screening methods to be used before a genetic test is available, or in conjunction with it. I would like to take this opportunity to thank all of the people who have travelled from far and wide to participate in screening, and particularly thanks to all the dogs for their excellent behaviour and understanding on unfamiliar territory! We could not do this research without you! If anyone has any questions, or would like to bring dogs or screening, or provide samples/pedigrees from Danes with DCM, please do not hesitate to contact Hannah Stephenson, at the University of Liverpool Small Animal Teaching Hospital on 0151 795 6100 (main reception number), or hmc79@liverpool.ac.uk.